Aloha E Komo Mai. 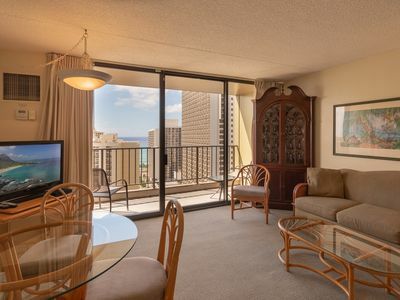 Welcome to our vacation rental at the Waikiki Banyan. View our VIDEO TOUR! Check out our photos (photo #3) to view a video tour of our condo. 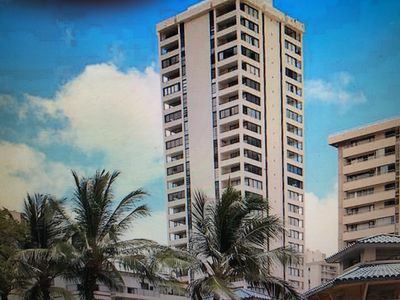 The Waikiki Banyan is one of Waikiki's most popular resort condominiums for vacation rentals, located one block from the beach in the heart of Waikiki. 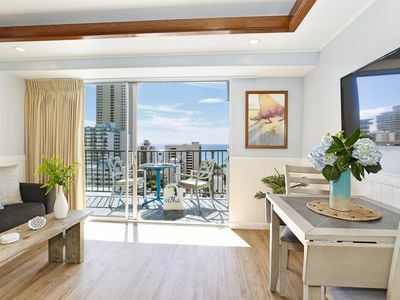 Located on the 31st floor in Tower 2, our 1 bedroom corner unit is the perfect home away from home while vacationing in Waikiki and Honolulu. 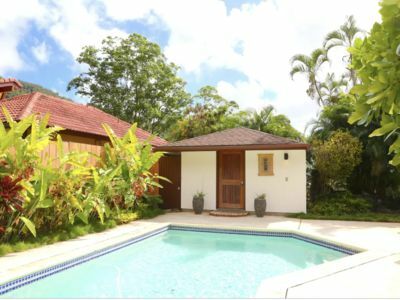 Enjoy the conveniences of a vacation rental by owner plus all the comforts of home in our completely renovated, 700 sq. ft. fully equipped and comfortably furnished suite. 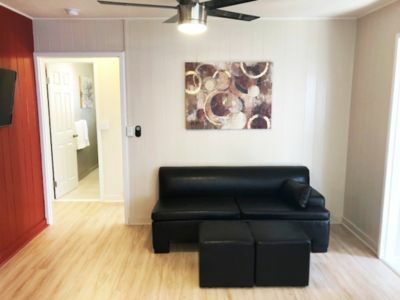 Free parking in the parkade, free long distance calls to the US and Canada and free High Speed fibre optic WiFi (wireless internet) is included with your rental. 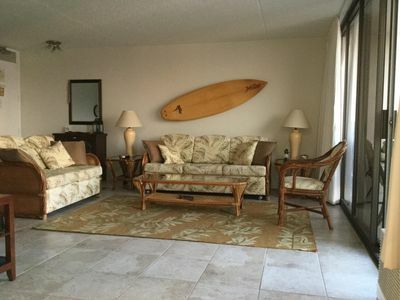 Our condo is equipped with everything you need including Tommy Bahama beach chairs and beach umbrella, beach towels, snorkel gear, binoculars for the spectacular rainbows we get just off our lanai and anything else you could possibly think of. 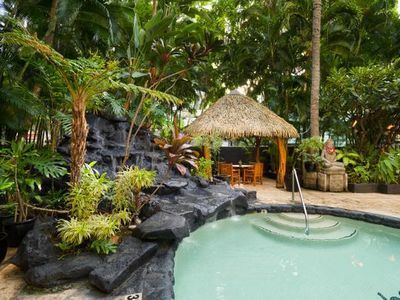 PLEASE NOTE: The Waikiki Banyan is a 100% NON SMOKING complex. 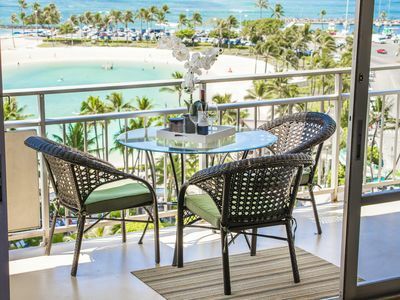 Smoking of any substance, including vaping or the use of e-cigarettes is NOT permitted in our condo, on the lanai, or anywhere on the Waikiki Banyan property. 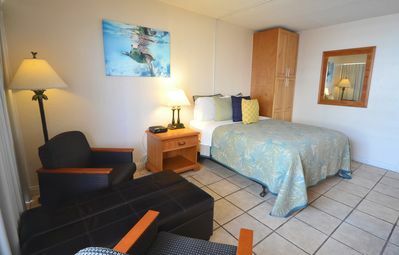 Our suite has been completely renovated from top to bottom and decorated in Hawaiian style. 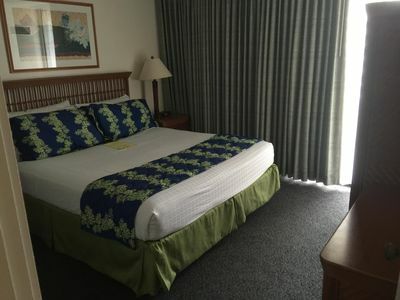 It has a separate bedroom with a super comfortable Simmons King size bed and windows on three sides to catch the Tradewinds and the stunning views. Blackout curtains, a ceiling fan and a powerful A/C unit ensure a cool, restful sleep. 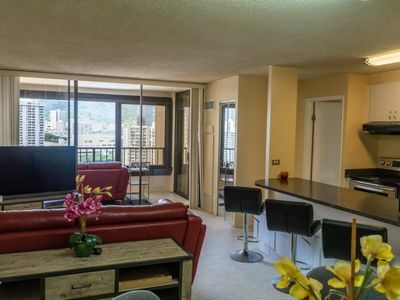 The renovated kitchen has granite counters, a window looking directly out to Diamond Head and is fully stocked with everything you could need including microwave oven, rice cooker, coffee maker, blender, dishes, cookware, etc. The spacious living room has a Queen size sofa bed with a firm, comfortable mattress, a love seat and a chair for plenty of seating. 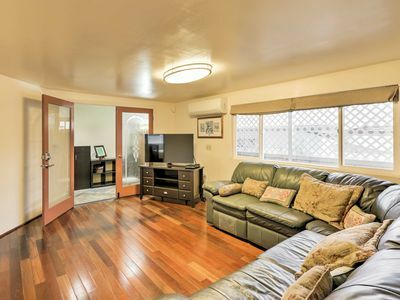 A large lanai with table and chairs offers fabulous, completely unobstructed views of the Koolau mountains, Ala Wai canal, golf course, and Diamond Head. 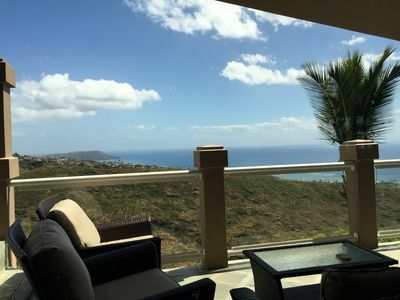 The lanai gets the morning sun and the afternoon shade and is the perfect place to enjoy your morning coffee or an afternoon glass of wine. Our nighttime view is spectacular with the lights of the valley reflected in the canal. Through a louvered door from the bedroom is the large, spacious bathroom which has a vanity area with granite countertop, lots of storage, plenty of towels and a hair dryer so you don’t need to bring your own. There is a glass door walk-in shower, featuring easy to clean solid surface quartz walls and a top of the line Grohe shower system. Taking a shower has never been more pleasurable. There is a 50” LED Roku Smart TV in the living room with over 170 channels of full HIgh Definition (HD) cable programming. The Smart TV has apps such as Netflix and more plus HDMI inputs if you’d rather bring your own streaming device. There is also a Bose Bluetooth soundbar connected to the TV for stereo tv sound or for streaming music wirelessly from your own device, and a Sony Blu Ray player. In the bedroom, there is a 28' LED TV with full HD cable programming. 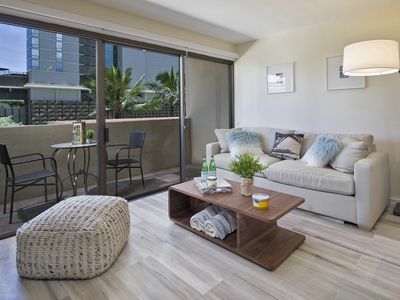 The porcelain tile floors keep the unit cool and easy to clean. A coin-operated laundry room ($2.00 each for washer/dryer) is just steps away, diagonally across the hall from our front door. There is a laundry room on every floor so machines are always available. The laundry machines take quarters or there is an app available to download to pay using your smart phone. The recreation deck on the 6th floor is perfect for the whole family with a large heated swimming pool, sauna, 2 hot tubs, barbecues, a putting green, children's playground, basketball and tennis courts and poolside snack bar. There is also a convenience store and an internet cafe in the lobby area. 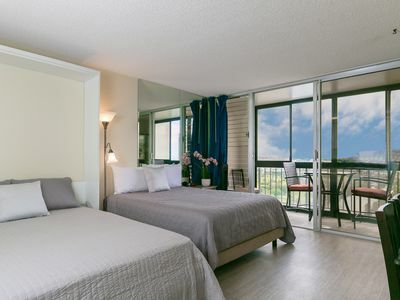 While the Banyan is a child-friendly complex, our suite is located on the opposite side of the recreation facilities (in Tower 2 or Mauka, facing the mountains), providing a peaceful retreat for those who are looking for a quiet, relaxing holiday. 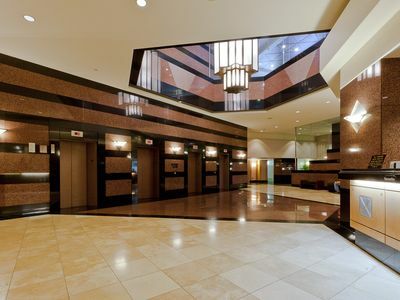 We purchased our condo in 2012 and lovingly renovated it with comfort and relaxation in mind. 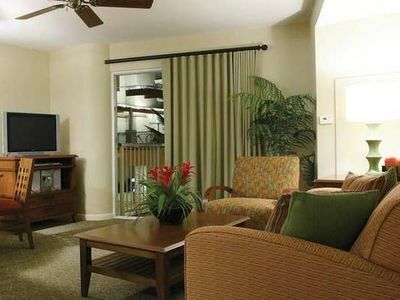 This is our home away from home and we look forward to welcoming you with aloha. We hope you enjoy it as much as we do! Mahalo Nui Loa. 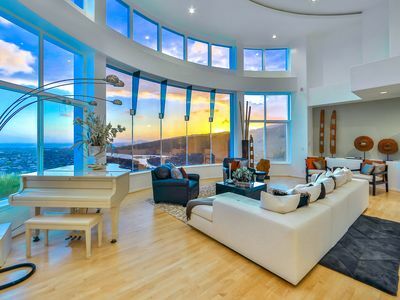 Upscale Luxury Condo with Superior Ocean and Beach Views! Last Minute Special Deal!! April, 2019!! Max. 25% Off!!! Check it out!!! 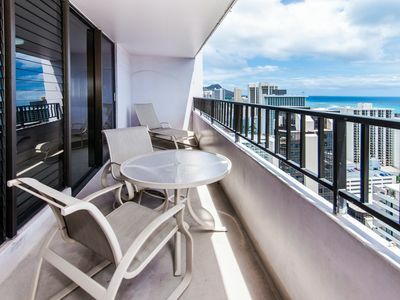 SS75 Steps from Waikiki Beach & can Sleep 1 - 3! 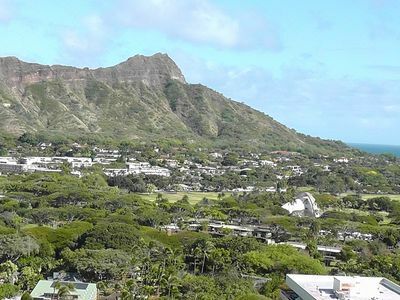 Spectacular Mountain and City Views in a Great Waikiki Location!